Acquired directly from the artist in 1948, and by descent. H. Pyle, Jack Butler Yeats A Catalogue Raisonné of the Oil Paintings II, London, 1992, no. 933, p. 844. 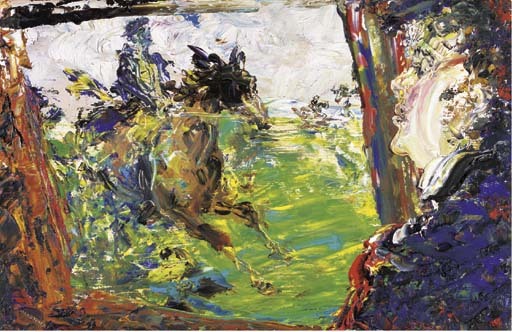 Painted in 1948, the present work depicts a figure looking out from a train window at a horse and rider, who surge forwards in a moment of unrestrained energy. The freedom and spontaneity demonstrated in the dynamism of this duo contrasts with the solitary seated person gazing wistfully out at them. It is a moment of intense revelation that Yeats conveys in this act of looking through a window and, in this painting, it connects two significant themes of his oeuvre. The subject of travelling, demonstrated in the train carriage, symbolises the unrelenting passage of life's journey while horses are, in Yeats's work, a metaphor for youth and all things free and unrestricted about his childhood spent in County Sligo. The unity of the horse and rider in The Nimrod of the Railway Train, framed by the carriage window, is emphasized by the vigorous paintwork that describes them; they cut across the horizon at a point where the head of both horse and rider stand out, silhouetted against the sky. As in My beautiful, My beautiful!, 1953 (private collection; H. Pyle, op. cit., no. 1157) and Horse without a rider, 1954 (H. Pyle, op. cit., no. 1161), the horse becomes almost transluscent, blending into and becoming an integral part of the landscape. Balancing this concentration of vitality is the sedentary figure, travelling forwards with the predictable and mechanical movement of the train. This figure becomes a metaphor for the artist's viewpoint, looking back at his own youth, and in turn the action of an observer looking at the painting. Although there is a prevalent feeling of nostalgia, through these acts of observation, the sheer physicality, embodied in the horse and rider, embues the work with an overall sense of optimism and celebration.